I was in MI-5 just long enough to realise, you can do good, or you can do well. Sooner or later, they make you choose. (SPOILERS) The last time I watched Spooks (or MI-5, as it is known in many countries) can have been no more recently than 2007, as Rupert Penry-Whatshishyphenate was still starring, and he got blown up soon after (as is wont to happen in their risk-friendly business). As the series carried on until 2010, and I only sporadically watched it before that, you could conclusively say I was only ever the most casual of viewers. It was okay, very much what you might expect of a BBC with one eye on the US (and the success of 24), having lost confidence in how to make their own style of television. Spooks could never really getting that the same kind of scale or conviction of threat as its American cousins, which rather worked against it. At its worst, it all looked rather silly, which undermined what was always the best aspect of British spydom: the intrigue itself. 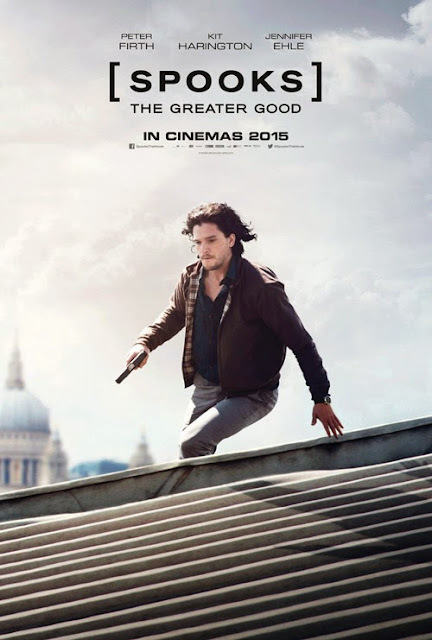 Spooks: The Greater Good, suffers from exactly the same problems. It even has coloned title, taking its cues from the Mission: Impossible approach. Those films work (well, except for the second one) because they are big, breathless, and have sufficient self-awareness to rattle on through their essential ludicrousness and make that a virtue. Spooks has no such luck; it's one nod to the less than earnest is a white cat as "evidence" of a suspect's villainy. Even 24 (okay, I ducked out of the last couple of seasons), which was desperately serious, generally succeeded by detaching its lead character from reality. Jack Bauer would be successively hurled into bubble realities where all he had to do was survive 40 minutes at a time. Spooks is unable to escape its limitations. Everything, from the roving camera mimicry to the thrall to London landmarks, is asking to be scoffed at for presuming it can compete with the big boys. Instead, when the umpteenth batch of terrorists arrive intent on blowing up a landmark, it invites derision. Spooks: The Greater Good does understand, however, that the most convincing way to present the intelligence services is to show them as inherently corrupt. In decades past, this was always a result of moles, or the cynicism of those in command; today it’s simply about corporate respect and branding. The makers know there’s insufficient reason to buy into the threat from foreign powers; it’s a bit passé. So, while The Greater Good comes replete with a stereotypical Middle Eastern terrorist (one who can be manipulated on account of his wife; very Bauer-esque), it can’t rely on that for sustenance. We the jaded public are so indifferent, we’d more need convincing that the intelligence services weren’t nefarious and working against out best interests. As such, there’s a notional recognition that out greatest enemy is really ourselves. While that’s also there in Tinker Tailor Soldier Spy, The Greater Good offers merely lip service, or rather gloss. Surface detail, rather than carefully hewn substance, and a wilful lack of political relevance. The Greater Good builds its plot on a series of half-baked tropes that don’t hold up for more than several seconds when sweated under harsh lights. Instead of working from a baseline of what British spy fare does well (John Le Carré, Len Deighton) and building in a few grand set pieces, we’re asled to suffer a series of WTFs. So someone in the MI-5 hierarchy allows terrorist Adem Qasim (Elyes Gabel) to escape custody and the reason is… they want the agency to collapse and be taken over by the CIA. As plot motivators go, it’s on the wispy side. 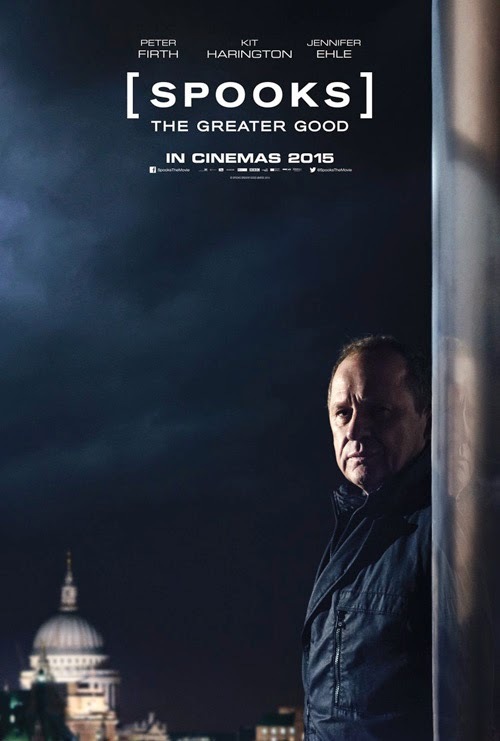 So too is stalwart Harry Pearce (Peter Firth), doing dodgy deals to get to the bottom of this conspiracy. He goes so far overboard that he gives Qasim the keys to intelligence community kingdom in exchange for calling off a planned bombing (the prize Harry has requested before this is no easier to swallow; a telephone number that may well be completely useless). It doesn’t help that everything takes place with a thunderously straight face. Harry’s the kind of maverick, hard-choices taking fellow intended to function as a British Bauer. The guy who will make the sacrifices, take the risks no one else can, because he believes the ends justify the means. Such flagrant copying of the 24 modus operandi would be all well and good if Harry could muster an ounce of Jack’s grit and determination. Or even if he could merely summon the clipped severity of a Le Carré spymaster. But Firth is a drab, stodgy presence, and as commanding as a custard eclair. Obviously, Spooks devotees will disagree, and as a lead he’s admittedly more agreeable than someone as wet and non-present as Clark Gregg in Agents of S.H.I.E.L.D. But that’s hardly an endorsement. It’s particularly a problem for a small screen hero pumped up to movie size, where the attention is all on him. Firth hasn’t had to deal with this kind of scrutiny since Lifeforce. Helping Harry out is special guest young buck Game of Thrones guy Kit Harington as Will Holloway. Will has history with Harry, inevitably of the “you knew my father” variety, and the movie’s to-and-fro “Can I trust you or can’t I?” poise quickly gets stale. The real question isn’t whether Will can trust Harry, it’s why/how Harry is continually given licence to get up to all sorts of unconscionable behaviour. Harington’s doing his best to score a succession of movie roles to ensure his post-Thrones longevity, but thus far they’ve been decidedly second-rate. He’s a likable presence, but not a weighty one. If he can’t galvanise himself towards a signature part equal to the agreeable Jon Snow, he’ll be consigned to supporting roles in no time. This is Bharat Nalluri’s fifth feature. It’s perhaps telling that his best received is Mrs Pettigrew Lives for a Day, decidedly not of the action genre to which he has staked his name (including the third entry in The Crow series). He directed the Spooks pilot all the way back in 2002, so they presumably thought they owed him. Nothing about the direction is bad per se, but nothing about is more than standard issue for this kind of fare. Lots of handheld camera, quick cutting etc. To be fair to Nalluri, he has a better sense of spatial geography than many who do this kind of thing, but he can’t disguise the holes in the plot. The highlights are a chase round Heathrow and a desperate attempt to eliminate a sniper during a meet, although blowing up David Harewood and shooting TV regular Lara Pulver maintain the Spooks agenda for shock deaths (which makes them less shocking, if you’re expecting them). Jennifer Ehle is in there; she’s always note-perfect, it’s just a shame the parts don’t tend to equal her talent. Tuppence Middleton is surely a next-big-Brit-thing in Hollywood any day now, and plays the questionable character line well until the writers fail her. Really, the only singularly great role is Tim McInnery’s sneering, MI-5 superior Mace. There’s a touch of continuity here, as the character showed up in four episodes, the last of which aired nearly a decade ago. Mace is everything Harry isn’t in terms of viewer engagement. Rude, witty, abrasive, and even rather brave when it comes down to it. McInnery would never be cast as the leading man, but if The Greater Good had focussed on him venting spleen at wholly unsuspecting terrorists it might feasibly have been a great movie. It probably wasn’t a bad idea on paper to bring back Spooks. When there’s a chance of a TV transition making a mint (like The Inbetweeners), it could easily be regarded as a no-brainer. But Spooks: The Greater Good isn’t sufficiently different. It’s borrowed writers from the last few seasons of the show, and a director from the first few. As such, it follows the restrained tradition of British big screen adaptations, rather than the flourish of US ones. Which is exactly what the show didn’t want to do at inception. It so desperately wanted to be our answer to their TV. All the cinema incarnation has done is show that its characters (or more particularly Harry) are ill suited to grand gestures. And that, for a British spy movie on a budget to really engage, it needs to put its script foot forward first, rather than striving for sub-Bond/Bourne spectacle.